Sachar, L. (2008). 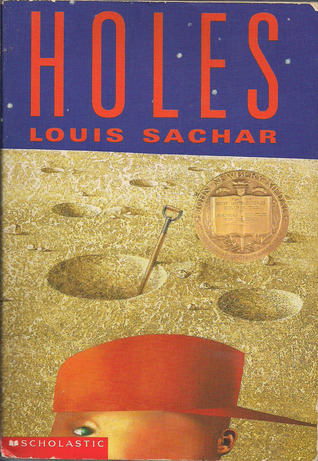 Holes: 10th anniversary edition. New York: Yearling. Personal reaction to the book: A great tween/teen story: Nice use of flashbacks, good moral without being moralist and a quick, fun read. Well-crafted characters. The mundane description of the bizarre work camp adds texture. It’s a book I happily recommended to my boys. I’ve seen a couple of little pieces of the movie and enjoyed that as well. The plot is familiar to readers of Joseph Campbell (although few teens will make that particular connection), with the hero making an impossible voyage to the underworld, surviving challenges along the way, and returning triumphant. I can’t imagine a kid who wouldn’t enjoy reading this book, although the shortage of female characters might scare off a girl looking for a role model. I have this on my unofficial quick-recommend list for the library. Author facts: Was raised in New York City and rural California. Lists as inspirational authors J.D. Salinger and Kurt Vonnegut, along with E.L. Doctorow, Margaret Atwood, E.B White, Richard Price and Kazuo Ishiguro. A job as noon supervisor at a local school started his career writing for youths.